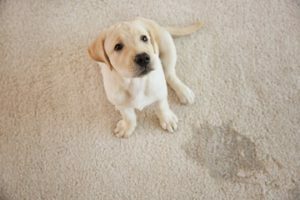 Pet stains on carpet or upholstery are a nightmare to clean up. From my experience, I have found the quicker I act upon them, the better results I will have of not getting a permanent stain on my carpet. That has led me to finding a pet carpet cleaner that I can quickly put into action. This Bissell Pet Stain Eraser Review is going to take a look at how easily it cleans pet stains, ease of use, how to use it, and the good and the bad of the product. What Is Included: Cordless Portable Carpet Cleaner, Recharging Cord, 2 Lithium Ion Rechargeable Batteries, Trial Size of Professional Spot & Stain +Oxy Formula. Specs: No heater, Tank Capacity 8 ounces, 15 minute run time, 4 hour charge time, cleaning path width is 3″. This portable carpet cleaner is intended to clean small areas where your pet has had an accident or you have spilled something. It is not intended to clean an entire room or a large area. The stain eraser works great on pet urine or feces, vomit, dirt, mud, blood, grass stains, coffee spills, red wine spills and much more. It works to clean small areas of carpet, upholstery, stairs, area rugs, auto interiors and pet beds. 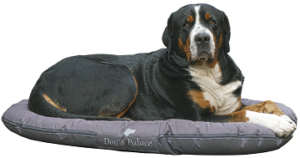 The Pet Stain Eraser even works on dog beds. 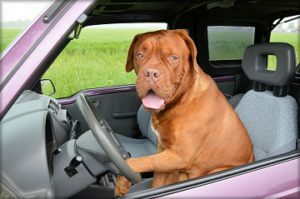 Like I mentioned before, when you have an emergency from an accident by your dog, or you spilled something on the carpet or couch, you need to act fast. That is why a portable carpet cleaner is the go to cleaner in my opinion. You don’t want to waste time getting some big cleaner out, filling it with water and carpet cleaner, plugging it in, and now finally be able to start cleaning. The Bissell Pet Stain Eraser is ready to go when the accident happens. Just grab it and go. There is nothing to plug in. Just keep it charged up ready to go. The formula is already stored in the machine. You don’t need to add any water. It is ready to work the second you grab the cleaner. This is the quickest portable cleaner I could find. There is no set up prior to being able to cleaning your spot. You can pre-treat stained or soiled areas if needed. Simply hold the unit above the solid surface and press the spray trigger until the area is wet. Let cleaning solution set for 5 minutes before cleaning. Be prepared when an accident happens. Spray cleaning solution on stain. Use built in brush to scrub continuing to spray cleaning solution. Using suction feature, press front of unit firmly against surface and pull toward you to remove cleaning solution. The dirt will go into the dirty water tank. Repeat the above steps until no more dirt or cleaning solution can be removed from the spot. Do not over wet the area. Remove dirty water tank for emptying and cleaning. Rinse with clean water. Remove front nozzle and rinse with clean water. Remove scrub brush and rinse with clean water. Never store unit with dirty water in water tank. The unit should not be left on its side with water in the dirty tank. Do not store the unit where freezing may occur. It could cause the unit to leak. Never use formulas containing lemon or pine oil. They may damage the appliance. Chemical spot cleaners or solvent based soil removers should not be used. They may react with the plastic materials, causing cracking and pitting. Only use genuine Bissell cleaning formulas for best results and to keep your cleaner properly working. I would recommend purchasing the Bissell cleaning formula at the same time that you purchase the cleaner itself. The included sample won’t last you very long. You can even use this cleaner in your car. No mixing with water. Cleaning formula is already stored in cleaner. Instantly and permanently removes tough pet stains and odors from carpet. Lightweight, only weighing 4.6 pounds. Carry handle for ease of operation. Wet cleaning only. This unit isn’t a portable vacuum cleaner. Tank size is only 8 ounces. Run time is 15 minutes. Make sure the unit is fully charged ahead of time, or it might go dead on you during cleaning. Complaints about the unit leaking. The response to this unit cleaning what needs to be cleaned up is nothing but positive. The Pet Stain Eraser gets the soiled area clean. That is great, since that is why we purchase this product. There have been several customers that have complained that the unit leaks water. I do not know if that is a problem with the product itself, or if that is operator error. Here is what Bissell says will cause the unit to leak. Formula tank is not properly seated. Dirty tank plug is not sealed properly. I have also mentioned above that storing the unit in freezing conditions could crack a unit, especially if it is wet or moist inside the unit. Also, using improper cleaning formulas can cause damage to the unit that could result in leaking. When I have a pet emergency on my carpet, I want something that is going to get the job done, and I want it to be quick and easy to use. I do believe that the Bissell Pet Stain Eraser can fulfill those needs. My Bissell Pet Stain Eraser review shows how easy it is to use, and that it will save time getting to work on the stain before it has a chance of setting in. Hundreds of customers have been very happy with this product and the results that it produces. There are a handful of customers that have had a leaking problem with the unit. This little guy will have a few accidents before he is potty trained. If you don’t feel that this is the right unit for you, you can read a review of a different pet stain carpet cleaner here. This unit isn’t as portable as the Pet Stain Eraser, but it is much quicker to get running than a full sized carpet cleaner, and lighter. If you follow the links to look at this product, there are 2 additional options available to purchase. There is the Deluxe unit which will include a detachable window tool for cleaning windows and there is the Deluxe Ion unit that also includes the window tool and an extra 30 minutes of run time on the unit. Please leave any questions or comments below. 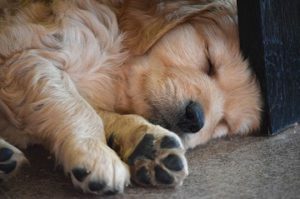 You can follow justforyourdog.com on Pinterest, FaceBook or Twitter for all the latest dog updates.